You may have noticed The Triangle was not in the stands last week. And you probably already know it was because of our financial problems. But because of a generous offer from the Office of Institutional Advancement this week to purchase the ad space needed to print, we’re back on the stands. Since we announced our financial struggles in our Jan. 25 issue, we received an outpouring of support from the Drexel community and have raised over $12,000 so far. We also received a fair bit of criticism. We realize that The Triangle is not perfect but we’re committed to taking on the challenge of drastically changing our publication for the better. With the help of The Triangle’s own alumni base, we’re rethinking every aspect of our publication. There’s not a single section or department in our organization that will go untouched in our reimagining process. Many of you have told us we should publish our stories online. Well, we do, and we have been for the past 20 years — the link is even in our masthead. But it’s clear we’re not communicating this to students effectively, and so we’re going to be ramping up our marketing and outreach efforts starting immediately. If you want news and updates directly on your social media feed, you can follow us on Facebook, Instagram and Twitter at @drexeltriangle. Our IT team is hard at work continuing to improve website functionality, especially on mobile devices. We’re making changes to ensure our content is easily accessible in the ways the Drexel community wants to see it. We understand we don’t always publish hard-hitting news, and so we’re in the process of assigning some of our staff as beat reporters, solely focused on the topics of crime, university policy, campus events and more. 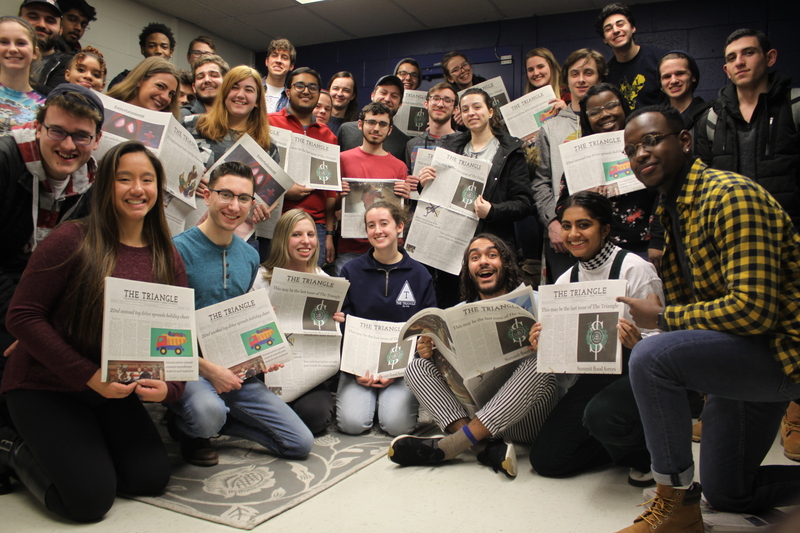 We’ll also be focusing more on getting breaking news out to students as soon as possible, even if that means reworking our entire editorial process. One of the most glaring criticisms we’ve seen is that our opinion section is too one-sided, and we wholeheartedly agree. Up until now, we’ve never actively recruited opinion writers based on their stances, but we heard your feedback and we’ll be reaching out to Drexel organizations all over the political spectrum to get every viewpoint on national topics. As we always have, we’ll continue to accept submissions from the Drexel community with opinions on campus politics, as well as your letters to the editor. If there’s ever an opinion piece you want to respond to or a rebuttal you want to make, send us an email at opinion@thetriangle.org. We know you can just go to drexeldragons.com for all your sports scores, so we’re going to start putting out sports content that’s more than just recaps of games. These new columns will highlight student athletes and their achievements, commentate on the future of Drexel sports and immerse readers into new aspects of athletics not covered anywhere else. Who wants to read a review of a concert that already happened? Not our readers, evidently! Our entertainment editors are hard at work to get a hold of pre-releases of albums, movies, TV shows and anything else for us to review so you can hear about them before anyone else. Over the next two terms, you’ll see us experimenting with all sorts of new formats, covers, graphics, fonts and more. And not only that, but we’ll be reaching out to you, our readers, around campus to see what you think. For the first time in our recent history, we’re committed to using our readers wishes as our primary driver for moving forward. The one thing we will not be doing, however, is keeping the status quo and waiting to run out of money again. We asked for your donations to keep us going in the short term while we figure out how to keep ourselves sustainable. We do not intend on operating solely on the goodwill of others for any extended period of time, and we hope you’ll bear with us as we grow into a better, self-sustaining publication.